This is one of our latest style wall lamps. Featuring locking brass swivel joints, Brass arms and a Brass wall Mount. Finished off with a high quality brass socket and brass paddle switch (on/off switch). Wired with twisted brown cloth cord. 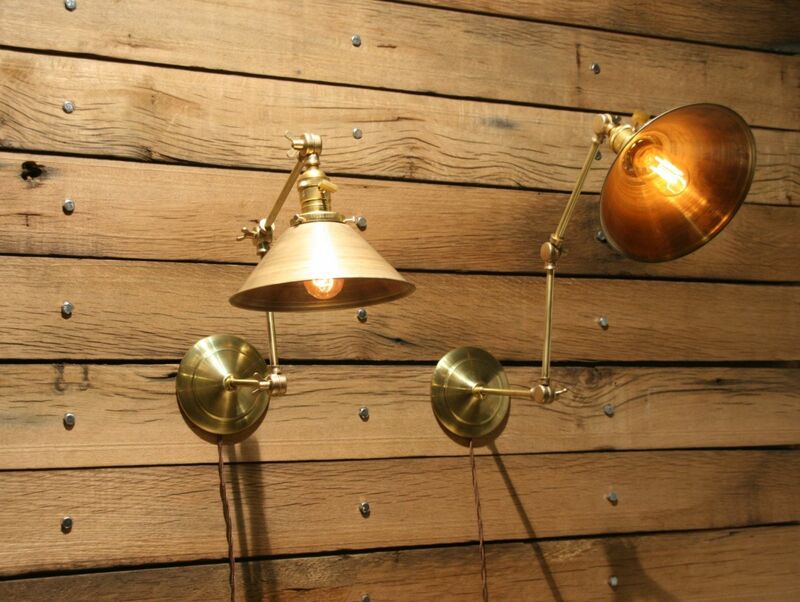 The shade is a HANDSPUN 8" Brass Shade that looks like it came straight out of the Industrial Age. Please keep in mind that with it being HandSpun there may be slight differences in the shade pictured and the shade you receive (such as color tone may differ slightly or may have slight smudge print). This wall sconce lamp is sure to please! She is extremely versatile and can be mounted on the wall, ceiling, or even on a desk, table or workbench. We can also do custom lengths if you like this style but need a larger size. Just contact us with the length you would like for a price quote. Quantities are available. Email with your quantity desired and your zip code and I will quote you cost with combined shipping. Base to 1 joint - 7-1/2"
Next to joints - 6"
Last joint to bottom of shade - 7-1/2"